Working with felt is so much fun. No frayed edges to worry about and a rainbow’s worth of colors to pick from. 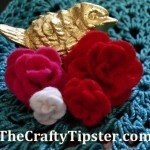 In this post, I’m sharing with you a clever no-sew felt flower brooch project from Kolleen. 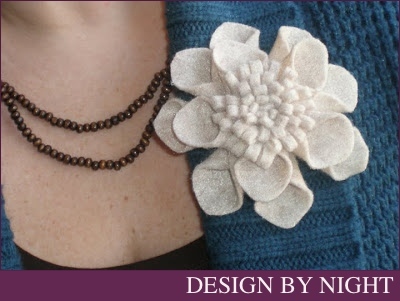 This lovely no-sew felt flower brooch combines several different techniques to make the flower’s center and petals. She uses hot glue. The entire design is based on not needing to break out needle and thread. However, I could see this flower brooch making up fairly quickly with some hand-sewing too. You know me, I just feel more secure using stitches rather than glue. Though, I would probably add a second round piece on the back to hide my stitches. 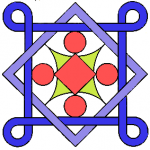 Kolleen has shared detailed written instructions, detailed photos and printable pattern pieces. 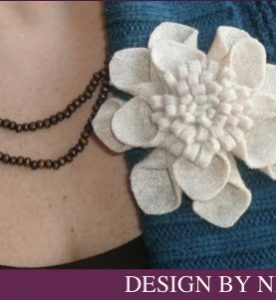 And while you’re visiting her blog, Design By Night, you might want to check out her other free no-sew felt flower and fabric flower tutorials. Her Etsy shop is full of stunning hair accessories suitable for everyday wear and formal occasions to crowns for Day of The Dead events. Isn’t this peacock feather hair piece lovely? 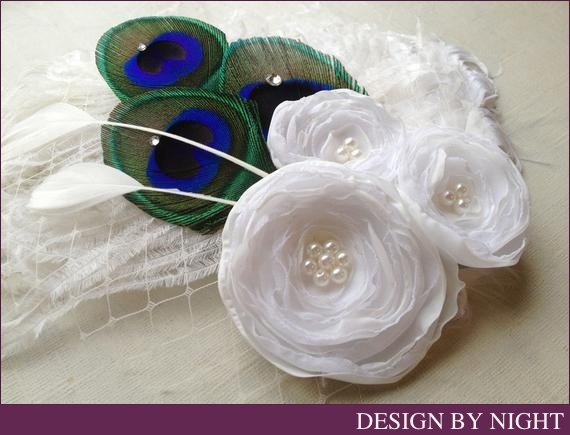 Her feathered and floral pieces are all hand made and are made to ensure you’ll be the belle of the ball.